SEPTA bus route 23, the longest bus route in Philadelphia, is backed up on a Wednesday afternoon in Center City--two buses in a row because the first one was so off schedule. After 65 years riding SEPTA's Route 23, Diana Wilson has mastered it. "I study the 23, honey," she said before hopping off the bus in Germantown to pick up her grandson. "You can wait for a long time. But if you study it, you can figure it out." That particular branch of public-transit scholarship is about to be transformed: Starting Sunday, SEPTA will split the route - which has traversed the city, in one form or another, for more than a century - into two. That schism will break up what had been SEPTA's busiest bus route, carrying 21,600 passengers on a typical weekday - and one of its longest, running nearly 14 miles from Broad and Oregon through Center City, into North Philadelphia and Germantown before rattling over cobblestones into Chestnut Hill. It also holds a lesser distinction. "Out of all the routes we have," said SEPTA spokesman Manny Smith, "it gets the most complaints." The new 23 will convey passengers from Chestnut Hill as far south as Walnut Street, while a new Route 45 bus will run from Noble Street to Oregon. SEPTA expects the curtailed lines will each be more reliable than the current 23 bus, which is late more than 60 percent of the time. What will be lost is harder to quantify, said Lamont McKellar, 37, who got on in Germantown and off in Hunting Park, where he was visiting his mother. "I always like the 23 for the demographic change. It's a nice tour of the area," he said. "In Chestnut Hill, it's white. Then you see working-class blacks, then poor blacks, then, down to South Philly, working-class whites. "A Penn professor wrote a book about it," he added, referencing sociologist Elijah Anderson's study of Germantown Avenue, Code of the Street. 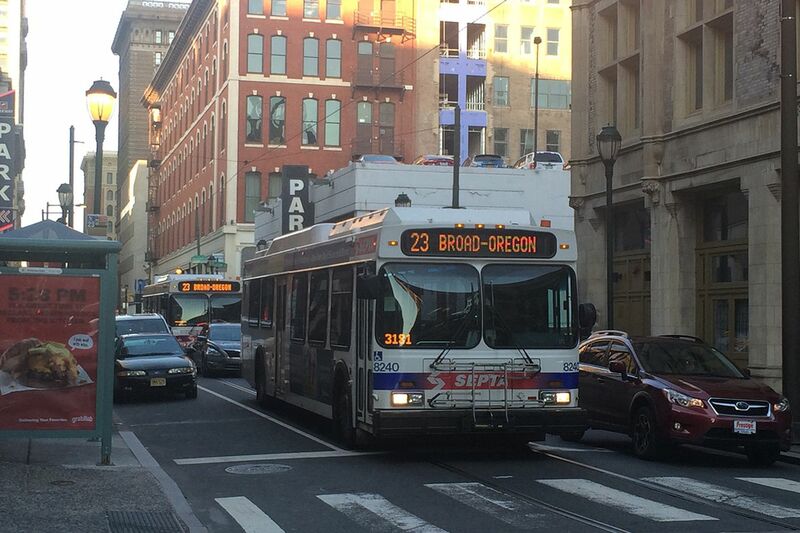 For decades, sociology students from Temple University and the University of Pennsylvania have been dispatched to ride the 23 as a class assignment. Riding south from Chestnut Hill on Wednesday, it was, indeed, a study in diversity. Departing from the first of 130 stops - near a sushi restaurant and a high-end cheese shop - it was already late. "It should have been here by now," Keith Stitch, 46, told an antsy Richard Trainer, who was heading to Wilmington for Thanksgiving with family. By the time the bus arrived, Trainer, 49, was fuming. "I just missed my train because the bus is late," he said. Still, he got on, settling in as the bus coasted through Mount Airy - weave salons and day cares, standing-room only. A man boarded offering Newport 100s, $7.50 a pack. Sabeerah Ali, 51, of Germantown, has been a rider for 49 years. Back when there were bus depots mid-route, she said, delays weren't bad. Now, it's a different story. "Two times this week, I waited 40 minutes for a bus," she said through her niqab. She thinks shorter runs could improve service, but thinks the route number should remain. "It's been the 23 forever, so changing it to the 45 doesn't make sense to me," she said. Maybe not forever - but close. The 23 started as a horsecar line in 1859, and went electric in 1894. Andrew Maginnis, 79, worked for SEPTA 38 years and rode the 23 even longer - from 1937 to 2000. He remembers when it was a trolley line and the fare was 8¾ cents. "In World War II, with gas rations, you didn't have a car," he said. "I used my two feet and took the 23. It was way of life. Those [trolley] cars were always crowded." He remembers when SEPTA took over in 1968, and switched to buses in 1992. The problem, he said, is the buses are too wide to pass one another on narrow streets. He'd like to see articulated light rail on the 23. SEPTA had dedicated funds to studying potential rail service on the 23, Smith said. "This has nothing to do with that." For now, the 23 remains packed as it leaves Germantown and steers into North Philadelphia. Outside the window the scenery changed, to dollar stores and check-cashing joints - then boarded up buildings still bearing signs for check-cashing joints now defunct. Not many people ride the bus beyond Center City in either direction; SEPTA estimates four passengers per trip will need to take advantage of the free transfer being offered between the 23 and 45. Robin Romeo - who goes just by "Romeo" - is one of them. He commutes from Germantown to UPS on Oregon Avenue, taking the 23 at least an hour each way. "I'm still trying to work out a plan," said Romeo, 33, for what to do once the route splits. As it is, he said, "It's hard for a person to keep a job, because if you miss a certain bus, you can't get to work on time." By the time the bus passed through Center City, it was so delayed that three more 23 buses were in line behind it. The cost of splitting the line is budgeted at $460,000 per year. SEPTA also spent $42,000 on newspaper ads, billboards, a bus wrap, and social media to inform passengers of the change. Still, Kim Lauletta, heading home to South Philadelphia from a job at Family Court on Arch Street, said she had only learned of the new route Tuesday. She's glad the change won't affect her, though she doesn't see a problem with the 23 as it was. "Except when it's trash day, it runs pretty regularly," she said. Still, it won't be the same for sociology students - or amateur sociologists like Ali, who recently went for a long ride. "I said, 'I haven't taken the 23 from Center City since I was a teenager, so I'll do that and see what's changed,' " she said. She added with a laugh: "It's pretty much the same.'" Percentage of time 23 bus is late.